The aim of this chapter is to present a perspective on advances in what is known about the stress biomarker cortisol in relation to theory, findings, and individual differences in reactivity of the hypothalamic-pituitary adrenal (HPA) endocrine system in so much as it affects behavior, emotions, and resilience. 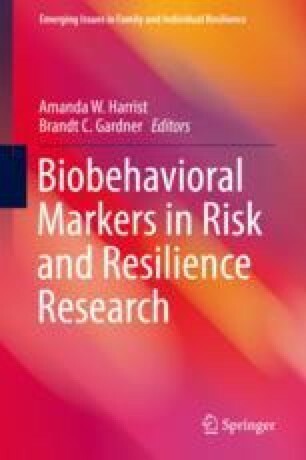 The chapter will progress via a short history of the integration of stress biomarkers in studies of health and risk and resilience. This history will be followed by discussing advances in theories of cortisol biomarker science with a specific emphasis on stress and contexts in which children and families develop. The biomarker and its links to trauma and maltreatment will be discussed as a specific instance of how early life stress affects the stress system, specifically cortisol. The chapter concludes with implications and prospects for the future of research on cortisol in the neurobiology of stress and resilience. An evolutionary based developmental theory that posits that characteristics of the family environment such as high stress and adverse family influences lead to individual differences in the functioning of the stress response system. Physical, sexual, or psychological mistreatment or neglect of a child or children, especially by a parent or other caregiver. A steroid hormone, in the glucocorticoid class of hormones. When used as a medication, it is known as hydrocortisone. An increase of about 50% in cortisol levels occurring 20–30 min after awakening in the morning in some people. Fluctuations that occur every day. A complex set of direct influences and feedback interactions among three endocrine glands: the hypothalamus, the pituitary gland (a pea-shaped structure located below the thalamus), and the adrenal glands (small, cone shaped organs on top of the kidneys). The HPG axis refers to the hypothalamus, pituitary gland, and gonadal glands. These glands often act in concert to play a critical part in the development and regulation of the reproductive and immune systems. Methylation refers to an epigenetic mechanism whereby cells control the expression of genes. Refers an emotional problem that can develop after a person is exposed to a traumatic event, such as sexual assault, warfare, traffic collisions, or other threats on a person’s life. Teicher, M.H., & Samson, J.A. (2016). Annual Research Review: Enduring neurobiological effects of childhood abuse and neglect. Journal of Child Psychology and Psychiatry, 57, 241–66. https://doi.org/10.1111/jcpp.12507.